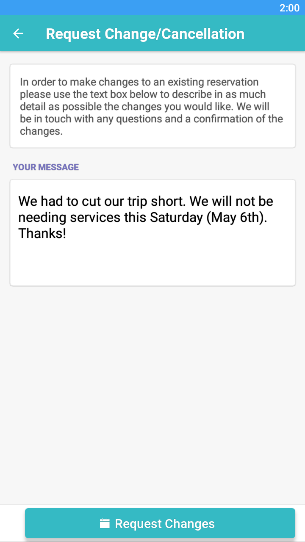 The "Schedule" section allows you to view your scheduled events, to request new services and to submit cancellation/change requests. 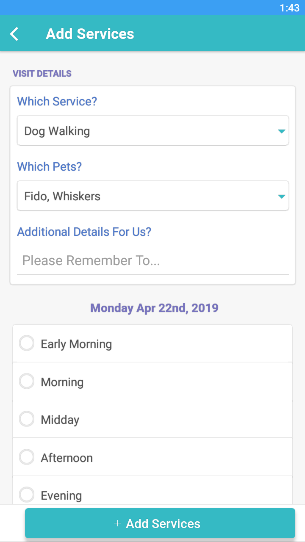 This section can be accessed by selecting the "Schedule" button on the bottom of the app. 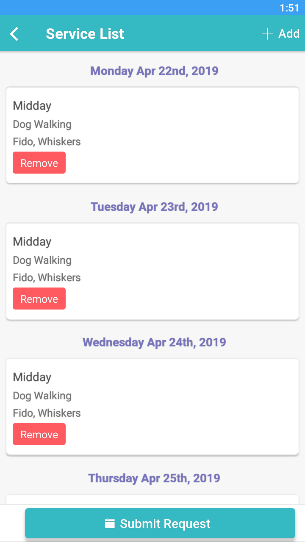 Please keep in mind that the configuration settings of your pet care company may cause your Client App to be configured differently from what is described in this help article. You can review all of your upcoming events by reviewing the list in the "Upcoming" section. You can also review past events by selecting the "Past" button on the top of the screen. 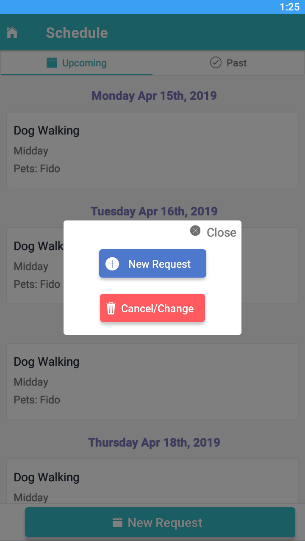 You can make a service request or submit a cancellation/change request by selecting the "New Request" button on the bottom right. You can submit a new service order request by selecting the "New Request" button. There are two types of service requests you can submit. The first is "Single Service" and the second is "Multiple Services". You can submit a request for just one event by selecting this option. You can then select the day you need a service and click the "Next" button. 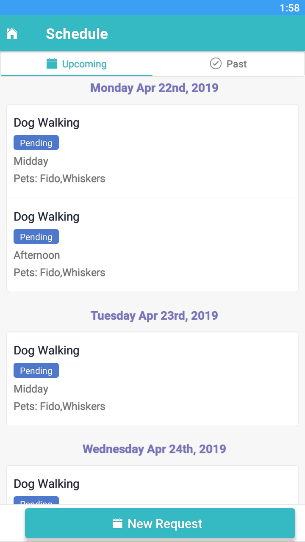 On the next screen, you can select the type of service you are requesting, which pets will be included in this request, add any additional details you would like to provide, and then select the time block you are requesting your service in. 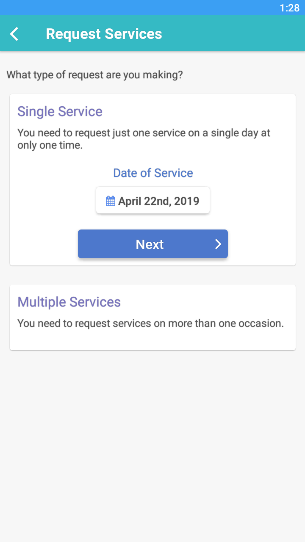 Once you are done with your selections, click the "Add Services" button at the bottom of the screen to submit your request. 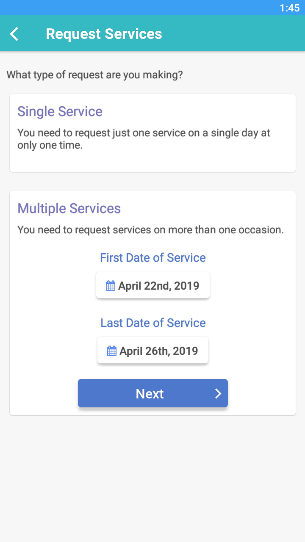 You can submit a request for multiple events by selecting the "Multiple Services" option. You can then select the first day and last day you need services and click the "Next" button. 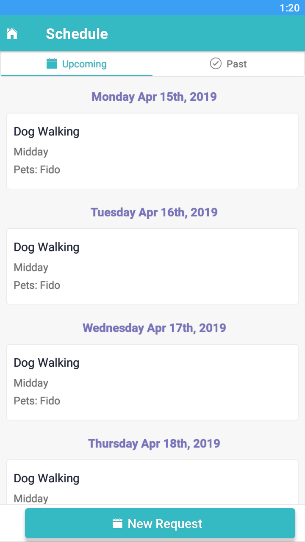 On the next screen, you can select the type of service you are requesting, which pets will be included in this request, add any additional details you would like to provide, and then select the time blocks you are requesting your service in for each day. Once you are done with your selections, click the "Add Services" button at the bottom of the screen. On the next screen, you see a list of the services you selected for you to review. If you need to add additional services, click "Add" at the top right of the screen. If you want to clear these services, click the back arrow at the top left. If everything is correct, click the "Submit Request" button at the bottom of the screen. After submitting your request, your events will be listed as pending until they are approved. After selecting the "New Request" button on the bottom right, you can select the "Cancellation/Change" to submit this request. After describing the cancellation/change request, click the "Request Changes" button at the bottom of the screen to submit your request.